This week's Sweet Melissa Sundays (SMS) recipe was chosen by Tiffany of A Spoonful of Laughter and a Heap of Love: Chocolate Walnut Brownies. 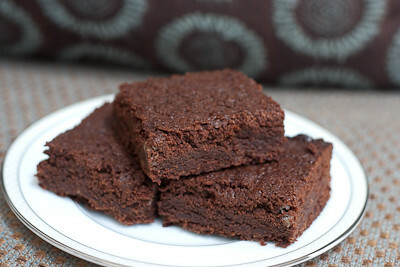 Melissa says these are based on a Julia Child recipe and describes them as "the best brownies I've ever met." So I could not pass these up, even though I just made York Peppermint Patty Brownies last week for Tuesdays with Dorie! I followed the recipe exactly as written, except I did not include the optional walnuts because I don't like nuts in my brownies. Unfortunately, I used my convection oven to bake these up and forgot to reduce the baking time :( So, instead of moist fudgey brownies, I ended up with dry, barely edible brownies! I was sorely disappointed because I knew that with two (yes, two!) sticks of butter in this recipe, these brownies had to be good. Oh well. Lesson learned. I will have to give these brownies another try in the future. Thanks Tiffany, for hosting this week. If you would like the recipe, you can find it here. 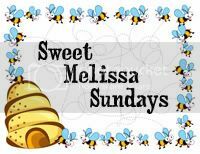 Make sure you check out the Sweet Melissa Sundays Blog Roll to see how everyone else enjoyed these classic, chocolate treats. Oh know! I have to reduce my convection oven 25 degrees and watch everything because they sure do bake hot. I have overbaked my share of everything since we bought ours . . . and the feeling is always deflating! Your photo does "look" delicious =). Too bad they were over done. I got a convection oven too recently and keep on forgetting to adjust temps when baking. I checked my brownies like 1000 times to make sure they didn't over bake. Oh! I hate baking disasters, maybe because they happen to me a lot!! Atleast you had the TWD brownies to cheer you up! No matter what, your brownies look great.